What started off as a weekly music event in the courtyards of Swifton Commons Mall during the months of July and August in 1985 has become the City’s longest running free summer concert series now in its 33nd year. The key to the longevity of this event is a combination of having the continued support of Fifth Third Bank as the Presenting Sponsor for over 27 years, the quality of the artists on the line-up and the loyal patrons who consider this event a rite of summer. The concerts have been recognized as The Best Shopping Center Promotion, The Second Day Issue location for Louis Armstrong Stamp and the stage platform for over 200 Jazz Legends, Grammy Award Winning Artists, and Jazz Masters on both a national and local level. In the past two years, the names of those artists have been incorporated in the promotional Artwork which is a collectable. It is common to see patrons wearing t-shirts and carrying handheld fans from 25 years ago. One of the founders, Carolyn Wallace, and now promoter for It’s Commonly Jazz, says the most important part of this venue is the people who attend. The patrons are loyal, sophisticated and knowledgeable about Jazz. They come in all sizes, ages, races, and income levels. Their common denominator is that they love Jazz and they come to listen and end up meeting and making new friends with people, who share their interest in Jazz. 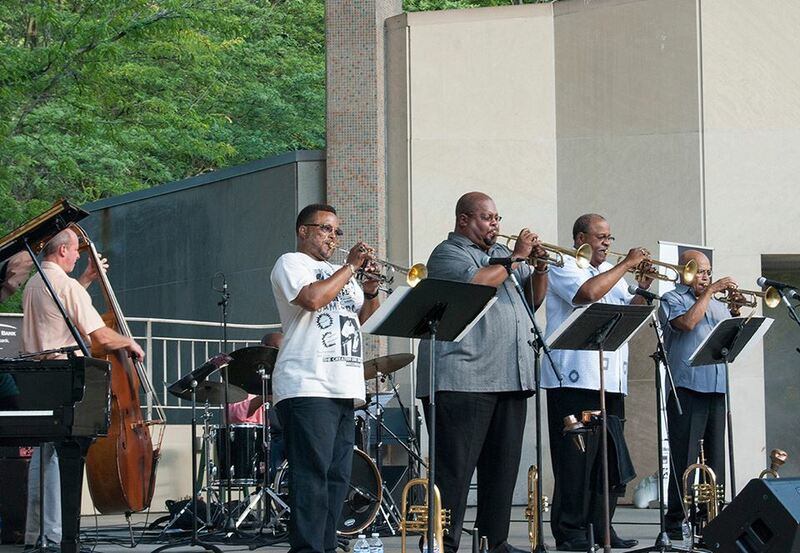 In 2008 It’s Commonly Jazz went green and moved to Seasongood Pavilion in Eden Park; one of the most recognizable and popular of the Cincinnati Parks. This beautiful park is home to the Cincinnati Art Museum, Cincinnati Playhouse in the Park and the Krohn Conservatory. The event took on a sustainable approach to their marketing by encouraging carpooling, using public transportation, having dual use for the collateral and teaching patrons during the intermission ways to live in a sustainable way with health, financial and recycling tips. The Jazz remains the focal part of this event and the artists legendary! It’s Commonly Jazz is sitting on a sound foundation that’s young and just getting ready to take off. Join us and become a part of something that has made summers in Cincinnati a special place to be for Jazz on Thursday Nights.